Proper execution of all manipulations that are associated with injections of anabolic steroids is an important aspect of successful and effective use of these drugs. Very important points that we must know for certain are the correct choice on the body, sites of injections, selection of syringes, drug preparation and, of course, compliance with all rules of hygiene. All anabolic steroids are oil-or water-based intended for intramuscular injection. This means that the needle must pass through the skin, subcutaneous tissue and enter into the muscles. Parts of the body, which are normally injected include: buttocks, lateral thigh and the deltoid muscle arms. Due to the large number of muscle fibers and extensive areas of connective tissue membranes (this kind of connective tissue covers the muscle and separates them from each other), the injected drug has an excellent opportunity for the rapid spread in the tissues. 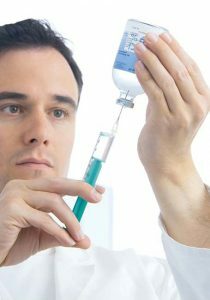 Ideally, intramuscular injections should be performed by injecting deep into the muscle in the area where no major nerves and blood vessels. The best site for steroid injections is the upper outer quarter of the buttocks. The crest of the Ilium may serve as a guide for this part of the buttocks. In the adult it is usually from 5 to 7.5 centimeters below the crest of this bone. Scallop Ilium – the upper part of the pelvic girdle with its back side. You can easily find it above the middle gluteal muscle. The upper outer quarter of the buttocks will be the best choice, because this part of the muscle is quite massive and contains a small number of nerve endings. The possibility of infusion of the drug into a blood vessel is very small. 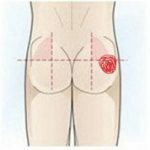 An injection in this area reduces the chance of touch the sciatic nerve, passing through the lower and middle parts of the gluteus Maximus. This nerve controls the entire leg, including the thigh and lower leg. 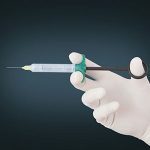 If injection is done too close to this nerve or the needle touches it, it feels intense pain and temporary paralysis occurs in this part of the body. It is very important for the introduction of steroids to choose the right syringe. The most suitable syringe for injecting steroids – tool 22 caliber needle is 4.8 cm or 24 gauge needle and 2.5 cm, capacity 4 cm CC Syringes with needles of such length suitable for intramuscular injection: the needle goes deep enough. Shorter needles too shallowly penetrate into the body, and sometimes of the drug into the subcutaneous region. It causes swelling between the skin and muscle and slows the absorption of the drug. When it comes to the caliber of the syringe, meaning the inner diameter of the needle. The smaller the caliber, the larger the diameter. Syringes 22 and 24 calibers represent the best option. For steroid injections are not suitable insulin needles: they are too small. First, before you take the vial and syringe, you need to take a cold shower. Then swab dipped in alcohol, wipe the place where you will make the shot. Another alcohol pad wipe the rubber stopper of the vial, through which pass the needle to the intake of the drug. Then take a disposable syringe, remove the needle with plastic tip, type of air into the syringe and insert the needle into the vial. Squeeze dialed in the air inside the bottle: this will create the necessary high pressure inside and provide easy intake of the drug in an oil base. Then turn the vial upside down and slowly dial the medication into a syringe with a bust about 1/4 cubic cm, for example, if you want to dial for the injection of 1 cubic cm, you should do too much of the drug with a volume of 1/4 to 1/2 cubic cm Then tap your finger on the cylinder of the syringe to make any air bubbles caught up inside, gathered in its upper part. Now squeeze the excess amount of the drug back into the vial and remove the needle from the tube. Then, holding the syringe needle upwards, again tap the cylinder to all of the remaining bubbles popped up. At this stage, take another disposable syringe, remove the needle and put a new needle in your drug filled syringe instead of a needle that you pierced the stopper of the vial. Using two needles for each injection, you will ensure a perfect sharpness of a needle. Be careful in all manipulations with the new needle do not touch it with your fingers. You should not wipe it with alcohol, it is absolutely sterile. Now, again wipe with alcohol spot for the injection, press the plunger of the syringe to squeeze out the last bubbles. Hold the syringe still needle up. Squeeze the bubbles until at the end of the needle does not seem a drop of oil. Let it run down the surface of the needle: this will provide the necessary lubrication. Now after all the preparations, hold the syringe in one hand like a javelin for throwing. Other hand to stretch the skin at the site chosen for the injection and insert the needle into the muscle with a rapid movement. After insertion of the needle into the muscle, gently pull the plunger to make sure that the cylinder is sucked into the blood. Making sure that the blood does not flow into the cylinder (this means that the needle is inserted correctly and has not touched the vessel), start slowly pushing on the piston. After all the oily solution will be extruded from the syringe, pull the needle quickly from the body, take another swab with alcohol and press them on a shot. Firstly this will stop krovotechenie, if such appear, and in addition, a strong push on the injection site and a slight massaging you reduce the sensation of pain. It is important that the drug was administered too quickly: fast injection is clearly more painful and at the time of injection, and in the following days you can stay pain. After the procedure, wear plastic caps on the needles and will make sure that a used syringe and needle were discarded and not used again. To avoid the discomfort and hardening of the tissues at the injection site, you should not enter at one time more than 2 cubic cm of the drug. Besides, it is not recommended to use the same place for injections more than twice a week (better once a week). Independent performance of injectable anabolic steroids is associated with certain risks. The most serious problem is the infection and the appearance of abscesses in the place of injections. Sometimes the skin at the injection site is sterile, and bacteria with the needle into the muscle. It may also be that the needle is to prick touched something non-sterile or disposable syringe is reused. Sometimes users have “sterile abscesses”. In this case , it is possible that this abscess is not caused by bacteria, and the delay in the availability of the drug. It is known that after repeated injections in place of injections there are knots of connective tissue that prepyatstvuyut the spread of the drug. This is particularly common in athletes who often administered large doses of steroids. The following behavior occurs: the solution is introduced at the injection site for several days is not dissolving. In the end, it turns into a collection of pus formed under the influence of biogenic organisms. The best way to avoid abscesses of this kind – not to do injections in the same place more than once or twice a week and never work more than 3cm. cube. in one spot in a week. As mentioned above, damage to a major nerve during the injection can cause pain and may even cause temporary paralysis in areas controlled by the nerve. This has happened with dozens of users of steroids. Most of them suffered from severe pain without any consequences. Usually damage such as sciatic nerve, entails complications, lasting up to 10 days. To avoid touching fibers is easy: only need to know the most suitable places for injection. Perforation of blood vessels is a common complication during the injection. This can cause a very strong krovotechenie after removal of the needle. Simply press firmly with a swab on the injection site, and krovotechenie will pass quickly. Such damage of the vessel leads generally to the appearance of bruises. To avoid falling into a major blood vessel, don’t forget after injecting the needle slightly to pull the plunger of the syringe on yourself to see if retracts into the cylinder the blood. If the syringe fills with blood, it means that the needle has punctured a vessel. Stop the injection and do another shot with the new area. When you take responsibility for self-introduction of steroids, don’t be afraid to be overly cautious. The use of steroids is quite risky in itself, to Supplement the dangers of carelessness when performing injections.